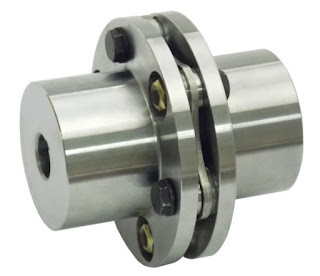 Disc couplings are a popular coupling design that continues to pick up steam within the power transmission industry in large part because they can transmit a significant amount of torque, while also being minimal maintenance. Unlike lubricated gear and grid couplings, disc pack couplings require no lubrication and periodic re-lubrication. This makes them ideal for applications that are hard to reach or get to... which, given increased maintenance department budget constraints... is broadly appealing across countless high torque applications and industries. Disc packs can be visually inspected without taking apart the coupling (a major time savings not true with gear or grid couplings) and have "theoretical infinite life" in that they have no wearing metal-on-metal misalignment handling flex points (as is the case with lubricated gear and grid couplings). 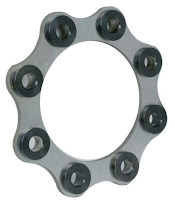 Rather, misalignment handling occurs through the flexing of unitized disc packs connecting two flanges together. Should a disc pack wear out (generally due to fatigue brought on by excessive misalignment), bolts and the unitized disc pack can be generally removed and replaced without having to move the installed coupling hubs. Furthermore (yes.. there are a lot of positives with this coupling type), generally being all metal (with no seals or gaskets) gives disc couplings the ability to withstand harsh environments.. And, lastly, to give one more potential major benefit (based on the application) over their lubricated brethren, disc couplings have torsional rigidity with no backlash. Limitations of disc couplings include no vibration dampening capability (a strength of elastomeric & grid couplings), and limited misalignment handling capability... particularly in regards to parrallel misalignment. (For a disc coupling to handle parallel misalignment, two disc packs must be used.) Additional considerations include speed limitations if not balanced (though these can be overcome as evidence by widespread disc coupling usage in API 610 and API 671 applications), and possible anti-flail concerns (though, again, anti-flail safety features can be added to many designs). Disc couplings and their disc packs are generally referred to by the number of bolts they have. Common bolt configurations include 4 bolt, 6 bolt, & 8 bolt. The reason bolt configurations are even is that torque is only carried in tension across every other leg of a disc pack (while the remaining legs will be in compression). In a 4 bolt design, 2 legs will be carrying the torque. In a 6 bolt, 3 legs... and, in an 8 bolt, 4 legs. The trade-off between the number of bolts is torque versus misalignment handling capability. More bolts (and more legs sharing the load) can carry higher torque loads, but this increase also decreases the flexibility of the disc pack and ability of the pack to handle increased misalignment. As illustrated in the diagram of the 6 bolt disc pack below, fasteners are then used to connect the disc pack bushings to the coupling flanges. 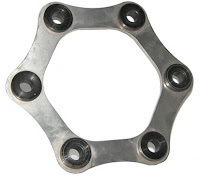 For each bushing location, the disc pack will be connected to only one of the two coupling flanges and the flange it is connected to will switch back and forth as you circle around the disc pack in either direction. To learn more about disc couplings, please go to Part 2 of this blog series... or check out Lovejoy's disc coupling product pages & catalogs, the non-lubricated section of The Coupling Handbook, and/or subscribe to this blog as there will be several more blog posts on disc couplings in the immediate future. Proud to be "Mobile Friendly"!